Located on the highly exclusive Millionaires’ Mile in Phuket island, Villa Banyan Phuket is a luxurious 6-bedroom piece of paradise resting on a hillside. This vacation dream is found in a picture-perfect tropical setting, affording guests some of the most amazing views in Thailand. It’s very prominent size can accommodate groups of up to 12 while providing infinite space. Villa Banyan Phuket is well-known for having some of the friendliest staff on the entire island, ensuring that guests receive the luxury treatment and service they deserve. The villa comprises three gorgeous buildings connected by walkways. Fantastic ocean views can be admired virtually anywhere inside the villa. The four master bedrooms and two guest rooms each hold a large ensuite bathroom, flat-screen TV with cable, safety deposit box, and an entertainment system. Hardwood timber elegantly styles the bedrooms, and soft, white bedding inspires a thoroughly peaceful atmosphere. 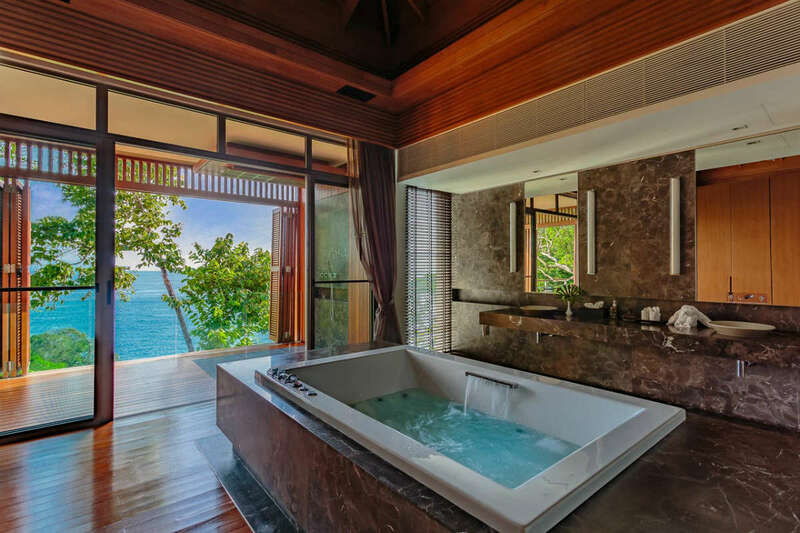 Various features and room configurations are included, such as king-size beds, jacuzzis, large bathtubs, private terraces with majestic views and so many more! The upper level hosts various common areas, such as the dining room, fully-equipped kitchen and living room wrapped by an expansive deck. Downstairs, a large family room opens onto the exclusive pool area, where guests typically like to enjoy their time together. Villa Banyan Phuket takes luxury seriously, housing various other common areas, including an entertainment room, full fitness room, ping pong table and dedicated room for yoga. A large infinity pool measuring 18-meters captivates guests’ spirits and brings about euphoric sensations as they witness jaw-dropping views and unparalleled sunsets from within. Some say the infinity pool affords guests a million-dollar view that one can only hope to see in a lifetime. Villa Banyan Phuket’s outdoors also include alfresco dining, lounging, wooden sunbeds for the perfect tan and a Thai-style open pavilion which can be used for lounging, alfresco breakfast or just spending quality time and savoring cocktails with good company. Further, guests have the luxury of taking a sweet run to one of Phuket’s most beautiful beaches or even explore crystal-blue waters of the rocky bay below. Regardless of taste and preference, Villa Banyan Phuket is a vacation destination like no other, sure to provide a traveling experience to be remembered forever. Product Description: Located on the highly exclusive Millionaires’ Mile in Phuket island, Villa Banyan Phuket is a luxurious 6-bedroom piece of paradise resting on a hillside. This vacation dream is found in a picture-perfect tropical setting, affording guests some of the most amazing views in Thailand. Send an inquiry about Villa Banyan Phuket, Phuket. We would like to extend our sincere thank you to every staff from Villa Banyan. You guys were awesome and we had a great time during our stay. Definitely a good recommendation for big group vacation.